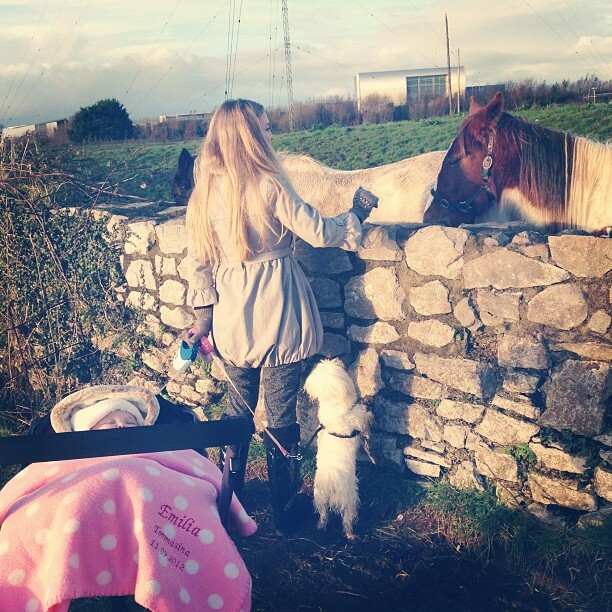 Out and About with The Family! Sorry I didn't get a chance to post yesterday! I had wanted to do a home decor post but we spent most of the day out running errands and by the time we came home it was dark and the lighting would have been crappy so I might do it tomorrow instead! 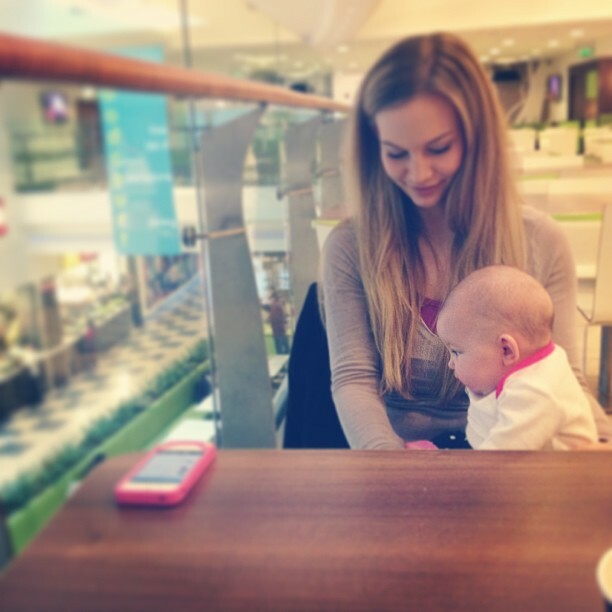 While we were having lunch Emilia had her first "people-watching" experience in Mahon Point...it was so cute! She couldn't seem to understand how there were people walking underneath us, ha ha ha! I also made a Keek of her enjoying the view - check it out here! 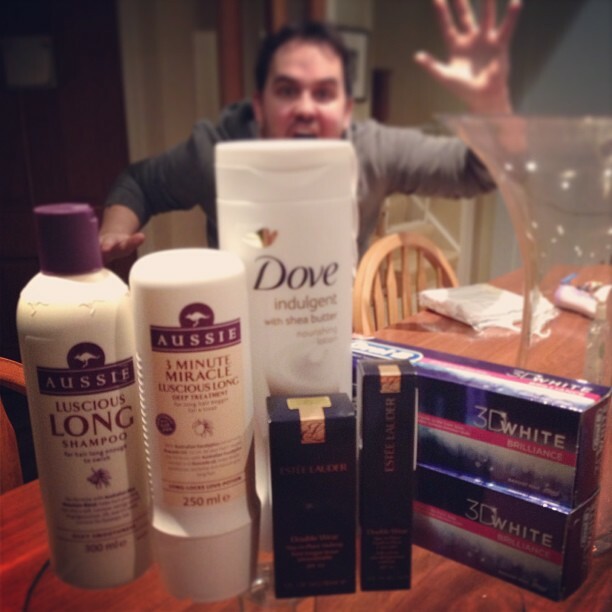 I picked up a few beauty items yesterday...check out Jofus photo bombing my haul, ha ha ha! ;) My Dumb Blonde Shampoo & Conditioner has run out and I'm looking for something different so I'm going to try Aussie for a change - never used it before! I've heard great things though, so I hope I'm not disappointed ;) Stocked up on a few basics as well - OralB 3D White toothpaste (the best! ), Estee Lauder Double Wear foundation AND concealer. I received a sample of the concealer and I love it for under the eyes! And finally, just some Dove Indulgent Body Lotion with Shea Butter...pretty boring but it's probably my favourite for everyday. I also got some Karvol capsules, recommended by my mom for poor Emilia. She appears to have caught Jonathan's bug and is coughing/congested with a stuffy nose :( Poor little thing...I feel so sorry for her! I put some drops of Karvol on her blankie and my pillow, which she doesn't really sleep on but more like next to it. Anyway thankfully it seems to be helping! Today she was feeling much better - yay! 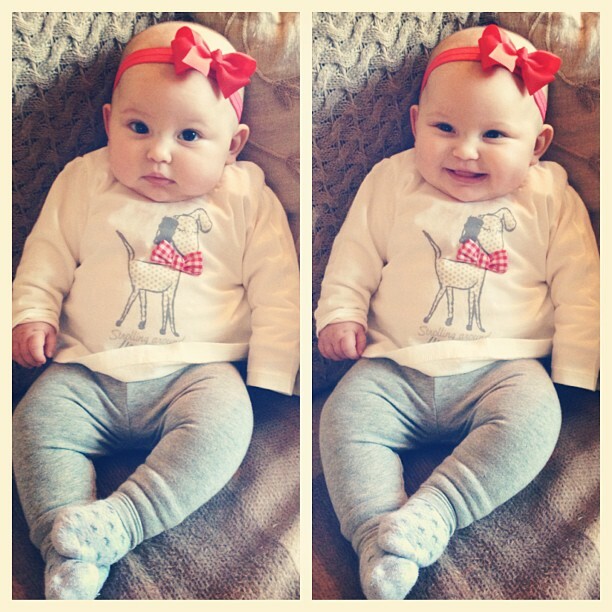 I cannot believe she is already wearing 6 months and some 6-9 month clothing!! Here she has on 6-9 in BabyGap. Eek! She is growing so fast! I loved so many of her 3-6 clothes, it was so sad putting them all away :( Her bow is by Layniebug Designs and the star socks are from Zara. It didn't seem like they were bullying Anna to me. I thought they were just letting her know she is perfectly fine to take a day or two from blogging and it's not something she needs to apologise for. That is exactly what I meant. I love this blog and this family. I feel bad that she starts her blogs with "I'm sorry....". She doesn't owe anyone an apology. Loved the house tour post btw! Hi anna! Poor emilia, hope she'll get better! Could you tell me the name of the type of coat your wearing in the photo? I saw you once wearing it in one of your vlogs and i'd really like to get one similar :) i think it's called a puffball coat? But im not sure. Hope you see this message. I wish you and your family a lovely week!